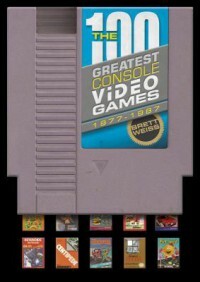 This book is a detailed overview of the so-called "golden age of console gaming", following a subjective selection and ordering of video games. Included are the context in which each game was created, its critical reception, both at the time it came out and over the years, and the price for which it can be bought today, making this book a mix of collector’s guide and historical document. Each game’s entry also includes color photographs of the cover, the cartridge, the instruction manual, and other promotional materials, as well as a screenshot of the game in action (although that’s not included for every game). The writing is very subjective and often punctuated by sarcasm, which can be rather off-putting. The choice of games is primarily informed by the most subjective of criteria: how much fun the game is to the author. It’s a problem shared by most of the books I’ve read dedicated to making best-of lists (although sometimes it is mitigated by having more than one author). In this case, the personal anecdotes about the author’s experience with playing the game, both as a child and an adult, and how much play time it gets with his children, detracted a bit from the reading. In part, I am to blame for that: I am not familiar with the author’s previous work as a video game critic - if I was (and if it is quality work), I would probably trust his judgment without needing further justification. As such, it would be nice to have had a deeper examination of each game (this happens with a few games, but not with all). These details aside, this book stands as a remarkable piece of research. The author went through hundreds of games (including ports for different consoles, spin-offs and rip-offs) in order to find the best of the best, and that is not an easy feat. For someone like me, born after the aforementioned golden age, this was an enjoyable read which allowed me to expand my knowledge about classic video games and rediscover some old favourites. An excellent way to immerse yourself in the world of retrogaming, whether you’re a newcomer or a veteran.